Why go to the store and buy butter when you can make some at home. 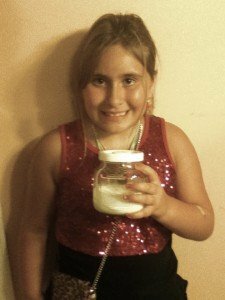 Making your own butter is fun and easy for kids of all ages. Follow the step-by-step directions below to make your own butter! Step 2: Put your marble into the jar. Step 3: Put the lid on your jar and tighten. This step is important, you do not want your cream flying out of your jar. Step 4: Shake bottle for approximately 10 minutes. As you shake the jar you will notice that the cream will begin to thicken. As it thickens it will be harder to shake. This is how you know that your butter is beginning to form. Step 5: Open the jar and you will see a solid mass (the butter). Pour out the excess liquid and place your butter in a bowl. Knead your butter add some salt if you like and enjoy!